Following farmers' protests against their displacement for land acquired for special economic zones (sezs), the central government on January 22, 2007, held up approvals for fresh sezs. So far, the total area that has been marked for land acquisition for 237 sezs across the country is about 34,509 hectare (ha) and obviously, several farmers' livelihoods are threatened. State governments have been acquiring land under the Land Acquisition Act, 1894, without offering farmers any relief or rehabilitation. Although the Union ministry of rural development has been asked to draw up a new relief and rehabilitation policy, scepticism remains. Not very far from the national capital, about 1,011 ha of land has been acquired in eight villages in Ghaziabad's Hapur tehsil in western Uttar Pradesh, for Reliance Energy Generation Ltd's (regl's) "world's largest gas-based power plant" and over 6,000 families have been displaced with meager compensation. Besides, there is provision for a new sez adjacent to the power plant. More displacement? The answer has to be in the affirmative, especially if it follows the way the regl power plant is coming up. Although the farmers are not against the power plant, the problem lies with the compensation, the way the land has been acquired and rehabilitation. Protests continue against the power plant. Compensation regl sought the Uttar Pradesh government's help to acquire the 1,011 ha in 2004 (see timeline Disturbing trends). Villagers allege that the government has taken away their land mischeviously without their consent at throw-away prices. Many haven't received compensation at all. Chief minster Mulayam Singh had announced compensation at Rs 310 per square yard (1 square yard=0.83 square metre) when he laid down the foundation stone on February 24, 2004, at Dehra village in Hapur but that didn't come through. The final compensation was pegged at Rs 150 per square yard. There is some confusion regarding this, which the then district collector of Ghaziabad, Santosh Yadav, explains. "When negotiations were going on, some representatives from Greater Noida were asking for a hike in compensation, which was fixed at Rs 268 for them. The chief minister promised people in Greater Noida compensation at the rate of Rs 310 per square yard. It was not meant for the people who would be displaced on account of the power plant in Ghaziabad. The Ghaziabad farmers have misunderstood the matter," says Yadav. But compensation or no, villagers didn't want to part with their "fertile land that produced three crops a year and sometimes, even four". "The administration has played with our sentiments. 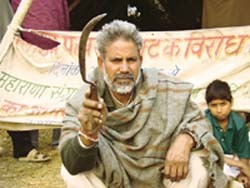 It first threatened some farmers that their leases would be cancelled if they didn't surrender and then they would be compensated at the circle rate of Rs 40 per square yard," says Mangu Singh Rana, president of Maharana Sangram Singh Kishan Sangharsh Samiti (msskss), a union of farmers created to convey dissent against the project. Manoj Bharadwaj, a farmer, says "I haven't taken a penny for my land but regl has already taken possession and had my land barbed." There are numerous cases of farmers suffering on account of the project but Yadav rejects farmers's claims. "Farmers were asking for only Rs 15-20 hike in addition to Rs 150.But if you look the sale deeds six months ago you will find the rates ranging from Rs 25-60 per square yard. Besides, the allegations that farmers were scared of their leases getting cancelled is not true because there are only 200 farmers who farm leased lands. Why did 2,800 land owning farmers sign the deed?" asks Yadav. But farmers say that they were coerced into leaving their lands. They now demand compensation at market rates. The rates of land at a high-tech city project at Dasna, 10 km away from the project, is Rs 450 per square yard. A kilometre away from Dasna is Bamheta where builders are paying farmers Rs 2,500 per square yard. Further ahead, farmers of Nai Basti, Bir Akbarpur and other neighbouring villages are selling their land for Rs 5,000 per square yard. A property dealer, on condition of anonymity, says that the compensation for farmers displaced by regl project is very low and that the appropriate rate could be close to Rs 450 per square yard. To solve the problem, farmers approached suspended Samajwadi Party leader Raj Babbar who, along with former prime minister V P Singh, formed the Jan Morcha to fight the cause. "We did a survey and were startled to learn that at least 1,21,406 ha of prime land near highways and fertile agriculture land was given to the industrialists across the state," says Babbar. Farmers feel that such projects should come up only on barren land. They fear that corporates might have hidden designs. A common question being raised is why did the government act as a middleman between farmers and regl. "Why didn't regl buy land from the farmers directly? Why did the government act as a broker?" asks Rana. "Farmers are not against the project. They also need electricity. Land was acquired in the name of 'public purpose' for the Uttar Pradesh Power Corporation. Why then was it given to regl?" Rana adds. According to Babbar, "This is a land scam amounting to thousand crores. regl has got a bank collateral loan at Rs 5,700 per square meter but it compensated farmers for only Rs 150 per sq yard." At the time of bidding, the capacity of the power plant was estimated at 3,740 mw. But regl now plans to raise it to 10,000 mw . According to a study by the Nagpur-based National Environmental Engineering Research Institute, land required per mega watt of gas-based power is 0.25 ha. This means, that for a 10,000 mw gas-based power project, a minimum of 2,500 ha is required. regl already has 1,011 ha, and it needs to acquire more land to build more capacity. Six thousand families have been affected by this project. Farmers are demanding a compensation at the rate of Rs 5,000 per square yard. They also want to become shareholders of the project. "We should be given employment in the project. Ten per cent of the land should be developed for residential and commercial purposes to cater to our forthcoming generations," Rana demands. Ghaziabad collector M K S Sundaram does not want to entertain this. "Besides the Rs 150 per square yard, an additional Rs 22 per square yard was promised to them. We are ready to talk to farmers for an amicable solution. They are demanding a compensation matching Noida rates. We do not have any law to enhance the rates. That can only be done only by the cabinet," he says.